Play the Mario Kart 2 Flash Game here. You can race against your opponents with your kart in 3 different game modes. First, you can drive through the career and thus unlock new vehicles. Also, you can play a single race under the Single Race option, while Time Trial is simply going out to get the best time you can, racing against the clock. Mario Kart 2 puts you in a really good mood and is a very entertaining game. In the overview you control the game with your mouse. You make a selection of game mode and track, select the difficulty level and finally start the race. During the races, Mario Kart 2 is played with the arrow keys. Forward is to accelerate, left and right steer and the down arrow key brakes. Along the way you will find banana peels on the track. These should be avoided if possible because they can slip the player and therefore slow the kart down. Sometimes you will find a box with a question mark on it. If you drive through it, you get a bonus for a short time. This can, for example, be a higher top speed or invulnerability. This is a great little flash game, which is the source of a lot of fun. The career mode against the computer is especially enjoyable, even though it's sometimes frustrating! If you set the difficulty level high, then Mario Cart 2 is appropriately difficult. An entertaining Flash game for a little break and the artwork is also quite appealing. Do you like Mario Kart 2? 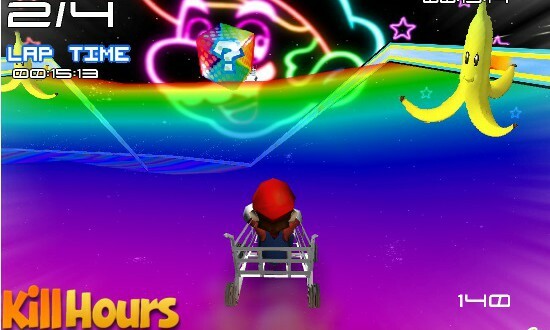 If you like Mario Kart 2, please click on the Facebook Like Button. With help of the likes on games, we generate our top 10 charts.